So sorry for not having posted for a while. Life just got REALLY crazy for me and I needed to shift my attention else where for a short bit. Ah, the life of a busy mom and volunteer! I met with a new client yesterday to discuss window treatments for her new (and BEAUTIFUL!) home. She already purchased fabulous drapery panels from JCPenny (Boy!~ Has their selection changed and IMPROVED!). She has different ceiling heights in the two rooms we will be working on, so she needs to re-order another size to give us more length to work with. Of course none of the pre-made panels are just right in length for what we need. Have you ever had this issue with “off the shelf” window treatments not being exactly the length you want and/or need? I seem to run across this issue quite frequently with my clients. But I have a great solution to create a custom look WITH “off the shelf” window treatments. The drapery panel in the below (sorry for the crummy picture!) was for a client’s family room. I was working with a tight budget for her kitchen and family room window treatments and decor. We were able to save money by purchasing a shorter pre-made panel to leave us money to order custom fabric. The top two-thirds of the panel is a silk dupioni panel in champagne from Pottery Barn. To make it more custom, I had a custom fabric band added to the bottom third of the panel. The entire cost for the drapery panel including labor, was less than $350 for the whole slider. 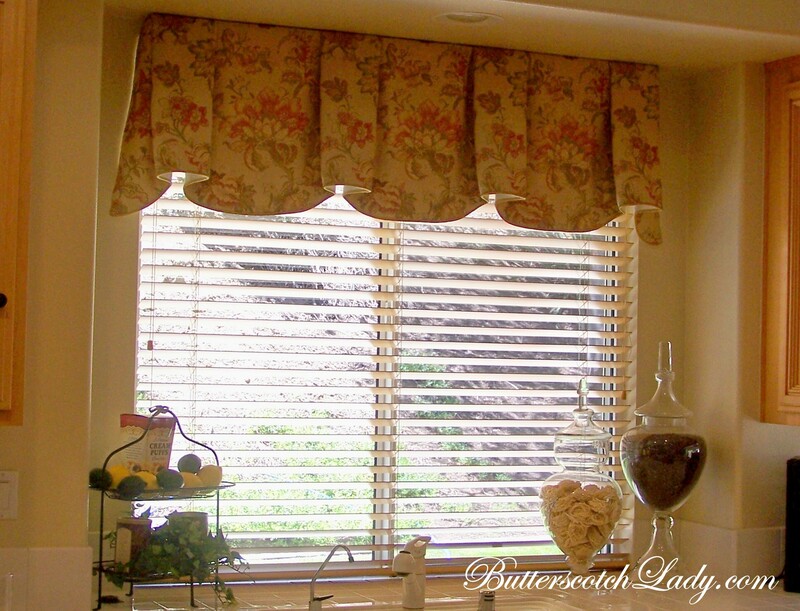 To tie in the kitchen window treatment, I had a valance made using the custom fabric from the slider panel. We ordered approx. 6 yards of the custom fabric (approx. $28 per yard) to complete two window treatments. Another way to create a more custom window treatment using “off the shelf” panels is to sew (or fabric glue) ribbon or trim to the top, bottom or side of the panels. Bullion fringe, like the one on the panels in the picture below can be purchased at locations such as Jo-Ann‘s Fabric, online or anywhere you can order custom fabric. Adding ribbon to the top of a panel instead of rings to a store-bought panel will also make it more custom and the possibilities are endless. You could change the ribbon seasonally for a whole new look with minimal effort and expense. So get creative and customize your “off the shelf” window treatments. Send me pictures of what you have done and I will post (with your permission) at in another blog entry. Want that custom look but not sure how to do it? Contact me and I can help you with ideas!